Get the most out of your trip to the 2018 German Grand Prix on July 19-22. Here’s our trackside guide to the Hockenheimring, including the full on-track schedule. With a compact stadium layout and plenty of passionate local fans, the trackside experience at the Hockenheimring is excellent. You are also free to check out the views from most of the grandstands on Friday, which is always an added bonus. More information on getting to the Hockenheimring and trackside parking can be found in our Getting There & Around Guide. More information on getting to the Hockenheimring and trackside parking can be found in our Getting There & Around Guide. The German Grand Prix weekend kicks off on Thursday afternoon with a public pit lane walk for holders of 3-day race tickets from 16:00-19:00. Track tours are also being held at this time, as well as a “Fan Party” on the pit straight. On Friday, July 20, spectators are free to check out the following grandstands: Südtribüne A-E-H, Nordtribüne B, Innentribüne C and Mercedes-Tribüne A-F.
Access to the following higher-priced grandstands is restricted to fans holding tickets for one of the grandstands: Haupttribüne, Südtribüne Yellow, C &D and Mercedes G-M. 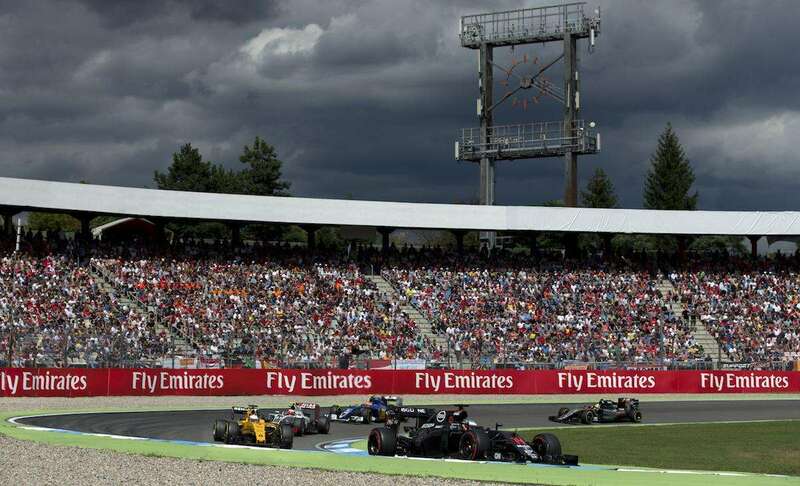 The following grandstands are closed on Friday: Südtribüne B-F-G, Innentribüne A/B & Nordtribüne A-C.
For the younger fans; Before the current layout was introduced in 2002, the Hockenheimring was a high-speed track with long straights deep into the forest, devoid of spectators. This layout featured legendary slipstream battles between drivers like Senna, Prost and Schumacher. After 2002 the old track layout was reforested. In areas where they drove cars at 350 km/h, it is now just grass and trees, but you can still make out the old circuit. For F1 fans who like adventure or just want a nice walk, this is the perfect place. The on-site museum at the Hockenheimring is worth checking out. Located between the South Grandstand and the A6 Motorway, entry is just €1 if you present a valid race ticket (otherwise €6). The display measures over 2000m2 and features 300 exhibits, including F1 cars from Zakspeed, ATS, Minardi, Benetton and Williams! This year, a special photographic exhibition is dedicated to the career of Jim Clark, who lost his life at the Hockenheimring in 1968. As usual, the F1 Fanzone (located behind the Main Grandstand) has plenty of activities to keep you occupied when there’s no action on the track. You can purchase the latest team merchandise or test your skills on various simulators and in pitstop and reaction time challenges. The F1 drivers will be appearing for an autograph session on the stage in the F1 Fanzone from 16:45-19:00 on Saturday, after qualifying. Been to the Hockenheimring? Leave a comment with your trackside tips!